Three of Taiwan’s premier biomedical institutions, DCB, PITDC, TMU, have teamed up with Baltimore-based Insilico Medicine to develop groundbreaking research in applied A.I. for biomedical science. 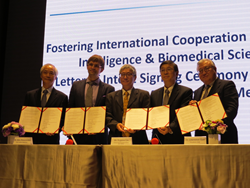 The four parties signed a Letter of Intent (LoI) for Cooperation at the BioTaiwan 2017 BioBusiness Asia Conference. The Development Center for Biotechnology (DCB), the Medical and Pharmaceutical Industrial Technology Development Center (PITDC), and Taipei Medical University (TMU), three of Taiwan’s premier biomedical institutions, have teamed up with Baltimore-based Insilico Medicine to develop groundbreaking research in applied A.I. for biomedical science. The four parties signed a Letter of Intent (LoI) for Cooperation at the BioTaiwan 2017 BioBusiness Asia Conference. Dr. Eugene Lin, Science and Technology Advisor of the Department of Industrial Development (DoIT), Ministry of Economic Affairs (MOEA) attended the signing ceremony to recognize the significance of such cooperation. “Taiwan is world renowned for its successful ICT industry, and now the government is turning its sights towards the biomedical industry. We encourage Taiwan’s research institutes and biomedical industry to work with the best partners in the world to foster innovation,” said Dr. Lin. TMU, one of the world’s top medical schools and hospital groups, has been a pioneer in adopting state-of-the-art technologies to provide healthcare services, and recently announced the adoption of IBM’s Watson Health. “TMU is dedicated to working with global tech leaders to provide the highest quality services and research in healthcare,” said Professor Yun Yen, President of TMU. PITDC, Taiwan’s leading medical and pharmaceutical research institute also announced its intent to adopt A.I. for drug discovery and development. “With increasing global competition, Taiwan’s pharmaceutical companies have to adopt an approach of open collaboration and take advantage of data science in order to transform and meet the needs of a fast changing future,” said Hsiu-Kang Chang, chairman of PITDC. Insilico Medicine, a rising star in applying A.I. in healthcare, has recently been identified as one of the top 5 A.I. startups for social impact by Nvidia. The company uses a new deep learning technique known as generative adversarial networks, or GANs. Yann LeCun, Director of AI Research at Facebook, has called GANs the most important and interesting idea in machine learning in the last 10 years. Dr. Alex Zhavoronkov, CEO of Insilico Medicine has emphasized that new deep learning techniques including GANs and one-shot learning provide a glimpse into the future of the AI-powered drug discovery engines that may enable smaller and newer entrants to compete with established drug discovery powerhouses. "A.I. is rapidly transforming some of the most conservative industries and is driving the fourth industrial revolution. Since its very inception Taiwan became the driver of innovation in Asia and took the leadership position during the computer and Internet booms. It is only natural for Taiwan to lead the fourth industrial revolution in health and longevity. We are deeply honored to take part in Taiwan DCB initiatives and partner with DCB, PITDC and TMU", said Alex Zhavoronkov, PhD, founder and CEO of Insilico Medicine. President Gan at DCB said, “With the dawning of precision medicine, we rely on scientific innovations and cutting edge technologies to identify biomarkers and develop personalized medicine and treatments.” “With the government’s support, DCB will host a parallel event titled ‘The Era of Digital Health: Innovation in Artificial Intelligence & Biomedical Industry’ at the 2017 World Congress on Information Technology (WCIT 2017) this coming September in Taipei,” he continued. “DCB is dedicated to connecting Taiwan with the world’s top biomed partners to promote open collaboration and innovations in biomedical science and healthcare,” he concluded. Established in 1984 by Taiwan’s Ministry of Economic Affairs (MOEA), Department of Industrial Technology (DoIT), the Development Center for Biotechnology (DCB) was initially tasked with establishing the biotechnology industry in Taiwan. With over 400 dedicated researchers and state-of-the-art facilities, DCB specializes in developing biologics and small molecule drugs, botanical drugs, as well as technologies required for preclinical testing. Its expertise arises from the integration of a number of diverse disciplines, including biology, chemistry, protein purification and engineering, as well as analytical and quality assurance. The Medical and Pharmaceutical Industry Technology and Development Center (PITDC) was jointly established by the Taiwan government and industrial sector, a nonprofit organization. Its core missions are to engage in new product development and establish key technology platforms, provide technology assistance and services to meet the needs of industry, and lead the Taiwan pharmaceutical & medical device industries into the global market. TMU is a leading medical institute in Taiwan and has five affiliated hospitals - TMU Hospital, Wan Fang Hospital, Shuang ho Hospital, Ningbo medical center and Taipei Cancer Center. With approximately 4,000 beds, TMU is one of the largest health care systems and offers top-quality teaching, research and clinical services in the Taipei metropolitan area. TMU strives to improve the quality of teaching, research and clinical services with the goal of becoming a fully internationalized university that ranks in the top tier worldwide. Insilico Medicine, Inc. is an artificial intelligence company located at the Emerging Technology Centers at the Johns Hopkins University Eastern campus in Baltimore with R&D resources in Belgium, Russia, and the UK hiring talent through hackathons and competitions. It utilizes advances in genomics, big data analysis and deep learning for in silico drug discovery and drug repurposing for aging and age-related diseases. The company pursues internal drug discovery programs in cancer, Parkinson's, Alzheimer's, ALS, diabetes, sarcopenia and geroprotector discovery. Through its Pharma.AI division, the company provides advanced machine learning services to biotechnology, pharmaceutical, and skin care companies. In 2017 NVIDIA selected Insilico as the top 5 AI companies for social impact.